(CNN) -- World record holder and Olympic champion Usain Bolt added yet another title to his tally after racing to victory in the Bupa Great CityGames 150 meter sprint in a new best time in Manchester on Sunday. 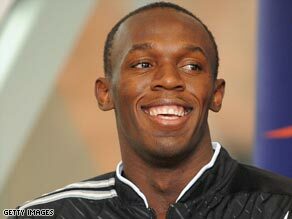 Usain Bolt smashed the world 150m record in his first race of the season in Manchester on Sunday. The Jamaican, who broke both the 100m and 200m records before anchoring his country to the 4x100m relay title in Beijing, clocked 14.36 seconds -- smashing the previous world's best by 0.39 seconds. Bolt, in his first competitive outing of the season, finished well ahead of Britain's Marlon Devonish, who ran 15.07. The 22-year-old, who was only passed fit on Monday after a car crash which required minor surgery on his foot just over a fortnight ago, was given a bye into the final. But he did not disappoint and the breakdown of times in his sprint were staggering. He covered the first 100m in 9.90, which although well short of his record-breaking 9.69 in Beijing, was still impressive on a very damp temporary track constructed in the city center. Even better was his speed over what is termed "the flying 100" -- from 50-150m -- which he covered in just 8.72 seconds. It all added up to a run which eclipsed the previous best of 14.75 by American Tyson Gay, whose time was recorded during a 200m race and not a straight 150m sprint. "It is one more to the tally," Bolt told reporters when told of his world-best time. "I thought I would just go out there and run a good time. I am not in the best shape and I still have a lot of work to do but I am getting there," he added. Debbie McKenzie Ferguson of the Bahamas won the women's race in 16.54 seconds ahead of Olympic and world 400m champion Christine Ohuruogu, who finished in 17.10.